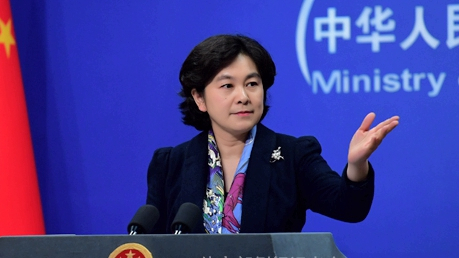 "I am not aware of the situation you mentioned," Foreign Ministry Spokesperson Hua Chunying said responding to a question on the matter. "No, I have not heard of that," she reiterated on a follow-up question by a reporter seeking a confirmation on the media reports. The Chinese authorities have previously taken compulsory measures in accordance with the law against two Canadian nationals, Michael Kovrig and Michael Spavor, who are suspected of engaging in activities that endanger China's national security, Hua stated. Former diplomat Kovrig and business consultant Spavor were detained on Dec. 10 and are being investigated by the Beijing State Security Bureau and the State Security Bureau of Dandong City, northeastern Liaoning province respectively, as confirmed by the foreign ministry. Canadian Prime Minister Justin Trudeau on Wednesday confirmed that a Canadian citizen, who was on Thursday identified by The National Post as Sarah McIver from Alberta, has been detained in China. He however denied that the matter was linked to the earlier detention of Huawei CFO Meng Wanzhou in Canada adding that he favored de-escalating the tensions surrounding her detention. Trudeau told reporters at a year-end news conference in Ottawa that the latest detention appears to be a routine case, not involving the sort of national security charges listed against the other two. He also raised the possibility of it being a visa issue. "There are tens of thousands of Canadians that live, travel and work in China," Trudeau said in French, reasoning that the new case "doesn't seem to fit the pattern of facts on the previous two." The National Post on Thursday reported that McIver, "who had been teaching at a school in China," was indeed taken into custody due to visa complications and arrangements were being made for her return to Canada. The Canadian newspaper had previously reported that the alleged detainee "was neither a diplomatic official, nor an entrepreneur operating in China." Global Affairs Canada spokeswoman Maegan Graveline confirmed that "consular officials are providing assistance to the family [of McIver]."